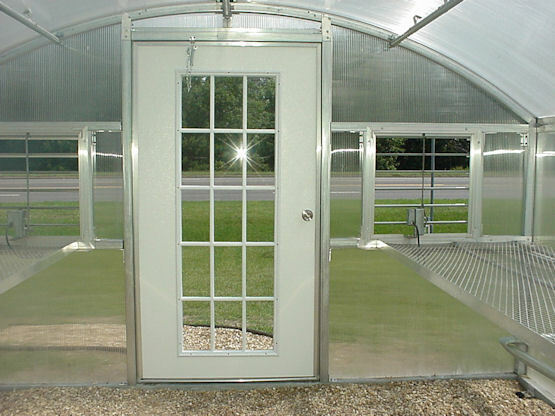 Polycarbonate Greenhouses are our top choice for functionality. They are available in many different configurations, including curved eave, straight eave, mill finish frames and painted frames. All of our polycarbonate greenhouses carry at least a 10 year warranty on the polycarbonate, with some manufacturers extending a 15 year warranty on the sheets. Looking for polycarbonate sheets? Find them here. 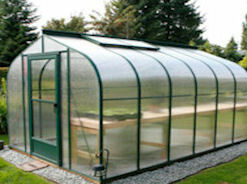 We prefer polycarbonate greenhouses for several reasons. First is the durability of the panels. Second is the higher insulation value you receive from the polycarbonate vs glass. Also, all of our glass greenhouses have tempered glass panels. But, under certain circumstances, the glass still may break. Polycarbonate panels for greenhouses have a ten year warranty against hail damage. If you want to see clearly out of your greenhouse, like looking through a pane of glass, you can do this with our new See Through Polycarbonate Greenhouse. It has a single, clear view panel in the sidewalls. Twinwall polycarbonate is like looking down the wall of a cardboard box. It has a sheet on the inside, a sheet on the outside, and a rib running through the center of it. The rib in the polycarbonate sheet is straight, rather than wavy like corrugated cardboard. But, the rib will distort your view. You will be able to see color, but not form through the polycarbonate. Honestly, this is the only downfall we can think of to twinwall polycarbonate greenhouses. 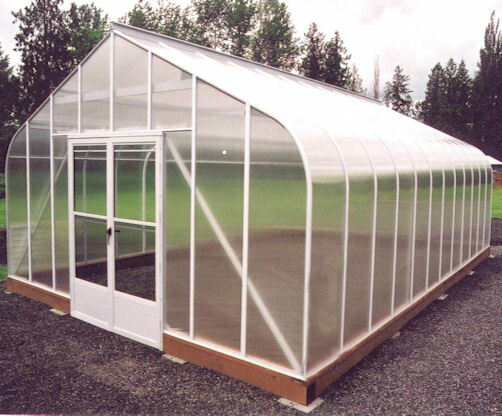 But, for better growing conditions, our top choice is a polycarbonate greenhouse. 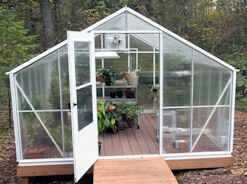 If you are searching for a lean-to or attached greenhouse kit, click here for more information. 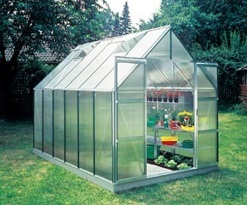 This greenhouse is available in a mill or highgrove green aluminum frame. 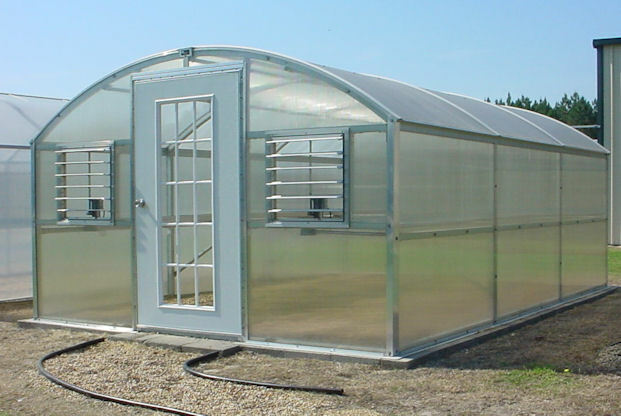 It has a large double door for ease of moving plants in and out. An optional base assures you of a simple and professional installation. New! Now you can have the best of both worlds with our See Through Polycarbonate Greenhouse. It has the durability of polycarbonate, with a clear view of glass. 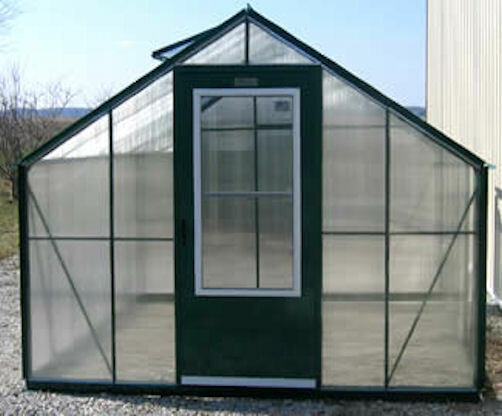 This greenhouse is available in 8 x 8 to 10x 16 sizes. The frame is either mill finish, green or white aluminum. It is glazed with 6mm twinwall polycarbonate. Prices start at $2524.00. Ventilation package is included with this kit. 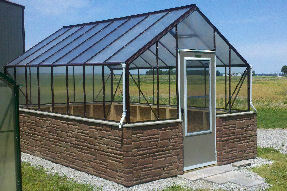 This greenhouse is available in 12 x 12 to 16 x 30 sizes. The frame is mill finish aluminum. It is glazed with 8mm twinwall polycarbonate Prices start at $5129.00.